The first thing you would notice about Craig and Elizabeth is that they are very caring individuals; both are educators and love working with children. Elizabeth is the founder of an educational non-profit in the SF Bay Area and Craig loves working with youth. They share a lot of love for their family and friends, and by extension, their community. You could feel that love radiate from them at their Elks Lodge San Rafael Wedding as their friends and family came together. Craig had just become an Elk and they were so excited to be able to use the Elks Lodge in San Rafael as their wedding venue. Who wouldn’t!? This venue is breathtaking. Elks Lodge was built in 1908 in San Rafael, California. 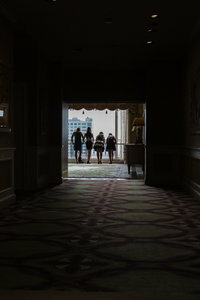 When you walk from room to room you feel transported into another time. 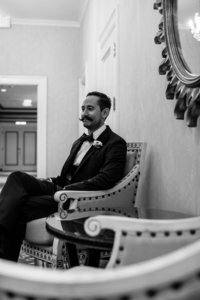 The groom’s prep room had a pool table, the walls and ceiling lined with deep dark wood, and the Tiffany light fixtures created a warm glow as the groomsmen got ready in their tuxedos and played a few rounds of pool. The bridal suite was perfect with its spaciousness and soft lighting from high windows and white painted walls. It was the ideal space for the bridesmaids to practice a dance Elizabeth had planned to surprise Craig with. They practiced all through the bridal prep to make sure they got it right! Needless to say, Craig was completely thrilled with the surprise dance and even joined in! The ceremony and reception were both outside on the Elks Lodge red brick patio, surrounded by beautifully manicured and maintained lawns, flowers, and bushes. The evening was full of dancing, laughing, and great food. As night began to fall the dance floor was illuminated by string lights and guests danced away the evening. Congratulations, Craig and Elizabeth! I wish you two the very best and many more wonderful surprise dances in the years to come. What a beautiful Elks Lodge San Rafael Wedding! You are a great wedding photographer and captured their day perfectly! I especially loved all their detail shots-great work! I can see why they love Elks Lodge and had their wedding there! Love the gown she chose for the ceremony. Great photos all around! what a stunning wedding at the beautiful San Rafael. The bride looked Amazing and her wedding dress is just so perfect. The whole wedidng from location to details looks absolutely breathtaking! 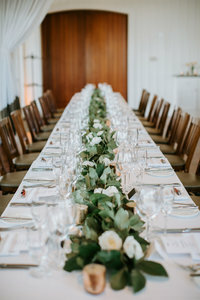 Love this sophisticated yet playful wedding at Elks Lodge San Rafael. Great use of hard light in their outdoor ceremony! Love all the architectural detail captured during the bridal prep! What a unique and awesome wedding at the Elks Lodge. I can totally see what you mean about the historic feel of this venue and you knocked it out of the park with these photos. I love the candid dance rehearsal during bridal prep and adore the way you shot their beautiful ceremony and the rustic feeling of these shots is top notch. What a cool peek into their day and their awesome photographs. Great job!